PleeDee is a 3 foot tall alien who jumps into her dad's spaceship and heads to earth after hearing about the Miss Universe contest. She's determined to come to our planet and win. But first she lands on earth in the time of dinosaurs. And then, when she finally gets to 2010, she takes a tour of Earth from Las Vegas to Waikiki, China, Africa and Italy before finally landing in Los Angeles for the pageant. There, she discovers that she doesn't want to be like the tall, skinny Miss Universe pageant competitors. She's perfectly happy with who she is. 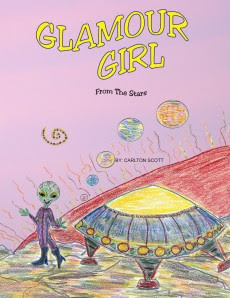 Glamour Girl from the Stars by Carlton Scott obviously has a powerful message for girls: Don't worry about being the glamour queen ~ just be yourself. As a mother of a little girl, I love this message. But I must say that the book itself isn't great for a three year old. The problem is that my daughter doesn't know what pageants are, and certainly has never heard of the Miss Universe pageant. At her age, she just didn't get the message. I think older girls would, though. M does tell me she likes this book, though. She has asked me to read it a few times. But it's a bit too wordy for her, at age 3. She's much more interested in the illustrations, which I think are very unique. The backgrounds of the pages are actually photographs. Then Scott has added illustrations that look like they were drawn with colored pencils or crayons. They actually look childlike. M loves the illustrations and wants to talk about all the details in them, rather than listen to me read the words on the pages. My kids are very interested in geography, and there is plenty in here as well with pages about different places around the world. M's favorite page is the Las Vegas page, where she always has many questions about the pictures. Carlton Scott has over fifteen years’ clinical experience as a traveling nurse (RN) with a specialty in critical care nursing and a focus on children’s health. He has worked with over 1000 children and teens in both mental health counseling and critical care nursing. Inspired by his desire to cheer up sick children, Scott has authored and illustrated three children’s books that teach kids the lessons of friendship, self-acceptance and adventure. As part of his commitment to supporting children’s health, he donates 50 percent of all profits from his books to children’s hospitals across the country. For more information about Carlton Scott and his books, visit www.carltonsbooks.com. For links to more reviews of Glamour Girl from the Stars and interviews with Carlton Scott, visit the blog tour page. This review was written based on a copy of Glamour Girl from the Stars that I received from Promo 101 Virtual Blog Tours.